Frost Blood E-Juice 60 ML (6 x 10ML) from Beast Cloud. We give you the best taste in an awesome blend of fresh Honeydew and the sweet and sour of Blackcurrant with a hint of refreshing Mint. Scrumptious, light and rejuvenating!. 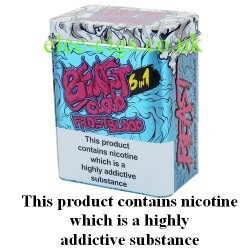 Frost Blood E-Juice 60 ML (6 x 10ML) from Beast Cloud is a wonderful, well presented E-Juice in a purpose made tin containing 6 x 10 ML bottles of 70-30 (VG/PG) mix with 3 mg (0.3%) of nicotine. Frost Blood E-Juice 60 ML (6 x 10ML) from Beast Cloud is for sale to persons aged 18 years or older. This product contains nicotine which is a highly addictive substance.